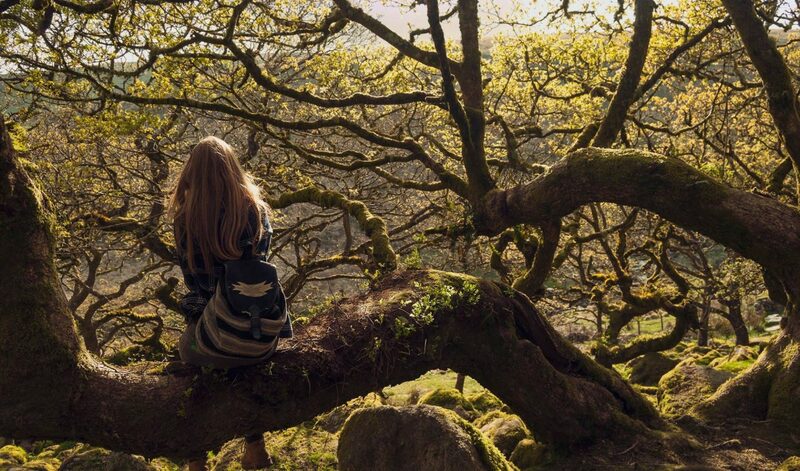 Twisted branches curl into a canopy above your head and sunlight glimmers onto moss covered boulders at your feet. 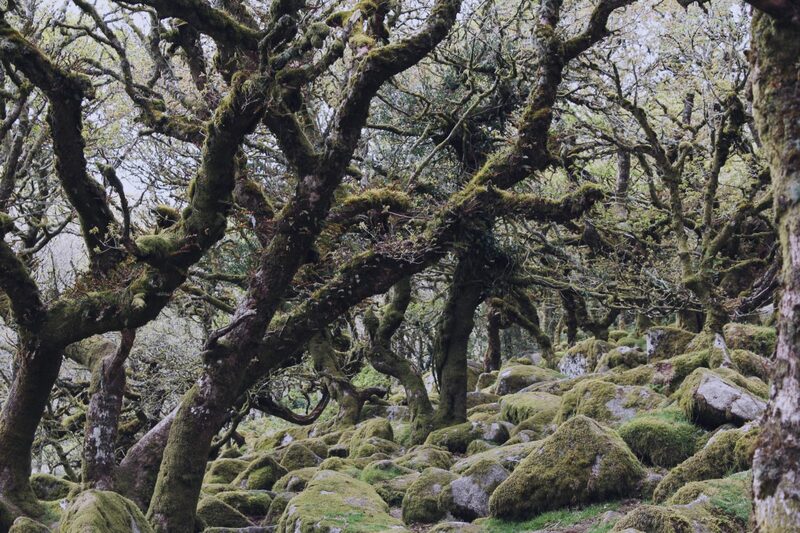 Tucked away in a valley on Dartmoor, Wistman’s Wood could be a threshold to another world. It’s a rare example of a stunted oak forest, with trees growing no more than 20ft above your head. It’s thought to be the last remnants of a forest that once covered the entirety of Dartmoor, with this particular patch being around 500 years old. At 9 acres, it’s a wonder why such a small area has been left untouched. The place is shrouded in myths and legend, from mystical Druids to the evil Wisht Hounds of the devil himself. When you visit this Tolkien-esque forest, it’s easy to see why. The early 19th century writings of Eliza Bray discuss Wistman’s Wood as one of the last remaining ancient Druid groves. Apparently, they conducted rituals here beneath the oaks, carving spirals and symbols into the moss that you can still see today. It takes little imagination to see why this is seen as a spiritual place. Wildflowers cling to every rock and branch, birds flitter between the leaves and the rush of the river can be heard in the valley below. It’s peaceful and incredibly beautiful. The charm of Wistman’s Wood seems to belong to the daylight. Come nightfall, the woods turn from sacred sanctuaries into kennels for Wisht Hounds, who hunt across the moors at night in search of lonely travellers, followed by their leader – the wild huntsman. The dogs are said to have yellow eyes, huge fangs and a howl that echoes along the misty moors when they are out chasing prey. The Wild Hunt is an ancient legend, with roots in primal Pagan beliefs. Today, it still lingers in this lonely corner of Dartmoor. Just north of Wistman’s Wood lies The Lych Way, an old processional route that crosses the moors to the parish of Lydford. Before cars, residents would have to take this long path to church on a Sunday and for important events, such as weddings and funerals. Coffins would need to be carried along this route, before being buried at the parish churchyard. It’s not surprising that this route also became known as The Way of the Dead. This pretty dark history has led to tales of ghostly apparitions along The Lych Way, especially near Wistman’s Wood. 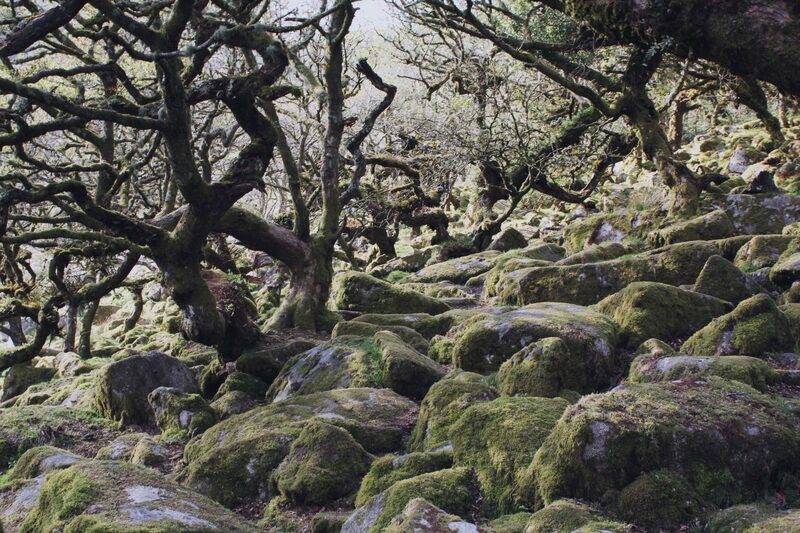 There’s a lot of debate about the origins of the name Wistman’s Wood. Some people believe it ties into the Druid legend, meaning wise man’s wood. The word wis is related to the Saxon word ‘to know’, with ‘wissman’ meaning ‘Wood of the Wise Man’. A more popular opinion, considering the wood’s location, is that it derives from the Devonshire word Wisht, which means pixie-led, or haunted. Dartmoor is notorious for its pixies, who seem to haunt every tor and outcrop. From leading lost travellers astray to causing cars to crash along the empty roads, they have a mischievous reputation. If the name is correct, then Wistman’s Wood is one place where you can surely expect to be pixie-led if you aren’t careful. You can get to Wistman’s Wood (SX 613770) by parking at the car park opposite the Two Bridges Hotel, just past Princetown on the B3357 (SX 609751). A wooden signpost reads ‘Wistman’s Wood’ and the trail is an easy 1.5 mile walk from the road.